Ceramic-on-ceramic (CoC) implants were initially introduced as an optimal bearing surface for total hip arthroplasty (THA) because they generate the least amount of wear particles and have long survivorship. It is an ideal bearing surface for young and active patients, as ceramic particles have relatively low biological activity, unlike metal particles generated from metal-on-metal implants. Another potential complication of THA with a CoC implant is ceramic fracture. Ceramic liner fractures can occur when inserting the component or after trauma secondary to impingement. Ceramic head fractures often occur after trauma. However, there have been reported cases in which CoC implant fractures have occurred atraumatically. This article presents one such case of CoC implant failure without any known trauma, as well as a method of surgically revising these cases. 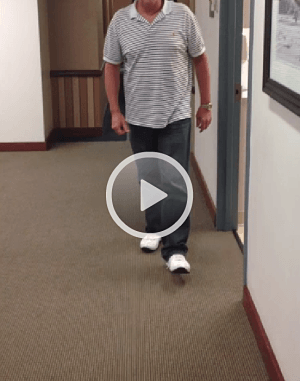 A healthy 62-year-old male presented to the clinic with asymptomatic squeaking with ambulation. He had undergone an uneventful left THA with a CoC implant 3 years earlier. The patient had no history of trauma, no pain with ambulation, no other systemic symptoms, and no prior symptoms of prolonged squeaking. The constant squeaking of the implant was having a negative impact on his quality of life. Figure 1 shows radiographic evaluation of the left hip in the immediate postoperative period 3 years prior to presentation. Figure 2 shows radiographic evaluation of the left hip 3 years after surgery; fractured ceramic fragments are visible. Figure 1. 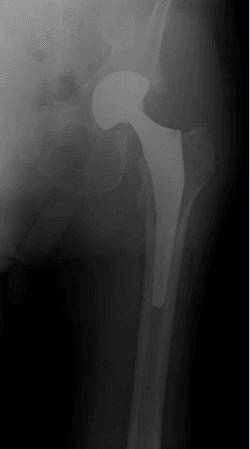 Postoperative radiograph showing the original total hip arthroplasty performed in 2010 with a ceramic-on-ceramic implant. Figure 2. Preoperative radiographs from 2013 showing the original hip implant with fractured ceramic pieces within the hip capsule. Anteroposterior view, left, and lateral view, right. The patient had a negative workup for infection, with a normal erythrocyte sedimentation rate and a normal C-reactive protein. A revision THA was recommended and he agreed to undergo the procedure. When the hip was exposed, extensive ceramic fragments were noted within the hip capsule, the result of fracture of the ceramic femoral head and ceramic acetabular liner. A complete synovectomy was performed to carefully remove all ceramic fragments. Extensive irrigation was performed in multiple steps to remove small ceramic debris. Once all fragments had been removed, along with the remaining femoral head and acetabular liner, the acetabulum was exposed. The existing, well-fixed cup was only able to accept a ceramic liner. Although CoC implant fractures have been revised with another CoC implant,  it was determined that this patient should be revised with a ceramic-on-polyethylene (CoP) implant to provide a bearing surface with a much lower risk of squeaking. The well-fixed acetabular component was removed with minimal bone loss, successive reaming was performed, and a larger acetabular component that could take a polyethylene liner was inserted. The trunnion was inspected and was noted to have minimal damage (Figure 3). Thus, it was determined that a Delta ceramic femoral head designed for revision (Biolox option) could be impacted directly onto the existing trunnion. The hip was reduced and had stability in all ranges of motion. Limb lengths were equal. The patient had an uneventful postoperative course in the hospital. At 1.5 years postoperatively, the patient has had no further complications, no pain, and no squeaking. Figure 3. Minimal wear noted on the existing femoral trunnion. Squeaking – most often associated with ambulating – is a well-reported phenomenon after THA with a CoC implant, with the incidence ranging from 1.9% to 10.7%. [2,3,9,10] This squeaking can be asymptomatic or it may be constant. This latter situation can lead to revision surgery, as reported in the Australian Registry (0.02%). Ceramic fracture is another complication of CoC implants that may be secondary to trauma, may occur intraoperatively during component insertion, or may occur atraumatically. Revision surgery is indicated in cases of clinically fractured components in order to remove the ceramic fragments and implant new components. Care must be taken to remove all fractured ceramic fragments. If these fragments are left within the joint, they can cause third body wear that could accelerate wear of the new components and lead to subsequent re-revision surgery. When all fracture fragments are removed, revision after a CoC implant failure generally has a low re-revision rate. After a complete debridement is performed, ensure that the revised hip is stable in all ranges of motion. If instability persists, an elevated liner or a constrained liner may be considered, depending on the patient. With regard to the new bearing surface, various studies have supported the use of another CoC implant or a CoP implant. In these revision cases, it is not recommended to implant a metal head, as there exists the possibility of small ceramic particles still being present in the surgical site. These small particles could become embedded in the polyethylene insert and damage the metal head. The femoral stem should be closely evaluated. If the stem is firmly fixed onto the surrounding bone, a careful evaluation of the stem taper condition must be carried out. If the stem taper is previously used and largely undamaged, a ceramic revision head should be used. If the stem taper is highly damaged, the femoral stem may have to be revised. Revision surgery is recommended as promptly as possible once a ceramic fracture has been identified to minimize damage to other implanted components. A complete synovectomy should be performed to ensure that all ceramic fragments have been removed, as third body particles can damage the new bearing surface.. Multiple irrigation steps of the surgical site allows for any small ceramic debris to float to the surface where it can be easily removed with suction. To evaluate whether an acetabular shell can remain in place, it is critical to carefully remove the existing ceramic liner using a specially designed removal instrument. 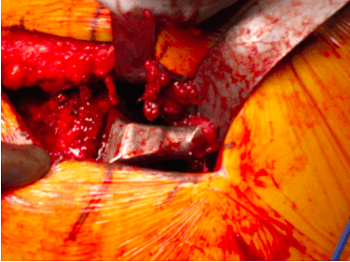 If there is any damage to the inner taper, the shell must be removed and a new acetabular shell designed for either a ceramic or a polyethylene insert should be implanted. In these CoC revision cases, it is important to carefully assess the stem and the insert taper surfaces. If the stem taper is highly damaged, the femoral stem should be revised, as it will affect the reliability of the replacement head. The femoral component does not need to be changed if minimal damage is noted on the trunnion of the existing femoral component. The use of a ceramic head designed for revision is recommended. Antonia F. Chen, MD, MBA, and Javad Parvizi, MD, FRCS, are from The Rothman Institute, Philadelphia, Pennsylvania. Gallo J, Goodman SB, Lostak J, Janout M. Advantages and disadvantages of ceramic on ceramic total hip arthroplasty: a review. Biomed Pap Med Fac Univ Palacky Olomouc Czech Repub. 2012 Sep;156(3):204-12. Restrepo C, Matar WY, Parvizi J, Rothman RH, Hozack WJ. Natural history of squeaking after total hip arthroplasty. Clin Orthop Relat Res. 2010 Sep;468(9):2340-5. Owen DH, Russell NC, Smith PN, Walter WL. An estimation of the incidence of squeaking and revision surgery for squeaking in ceramic-on-ceramic total hip replacement: a meta-analysis and report from the Australian Orthopaedic Association National Joint Registry. Bone Joint J. 2014 Feb;96-B(2):181-7. Abdel MP, Heyse TJ, Elpers ME, Mayman DJ, Su EP, Pellicci PM, Wright TM, Padgett DE. Ceramic liner fractures presenting as squeaking after primary total hip arthroplasty. J Bone Joint Surg Am. 2014 Jan 1;96(1):27-31. Dacheux C, Bocquet D, Migaud H, Girard J. Incidental discovery of an undisplaced ceramic liner fracture at total hip arthroplasty revision for squeaking. Orthop Traumatol Surg Res. 2013 Sep;99(5):631-4. Chang JD, Kamdar R, Yoo JH, Hur M, Lee SS. Third-generation ceramic-on-ceramic bearing surfaces in revision total hip arthroplasty. J Arthroplasty. 2009 Dec;24(8):1231-5. Brandt JM, Gascoyne TC, Guenther LE, Allen A, Hedden DR, Turgeon TR, Bohm ER. 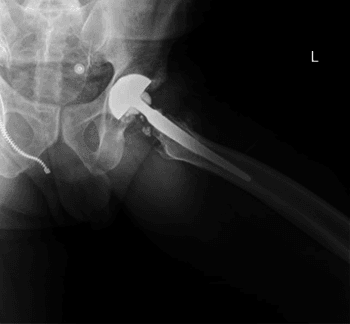 Clinical failure analysis of contemporary ceramic-on-ceramic total hip replacements. Proc Inst Mech Eng H. 2013 Aug;227(8):833-46. Traina F, De Fine M, Di Martino A, Faldini C. Fracture of ceramic bearing surfaces following total hip replacement: a systematic review. Biomed Res Int. 2013;2013:157247. Jarrett CA, Ranawat AS, Bruzzone M, Blum YC, Rodriguez JA, Ranawat CS. The squeaking hip: a phenomenon of ceramic-on-ceramic total hip arthroplasty. J Bone Joint Surg Am. 2009 Jun;91(6):1344-9. Schroder D, Bornstein L, Bostrom MP, Nestor BJ, Padgett DE, Westrich GH. Ceramic-on-ceramic total hip arthroplasty: incidence of instability and noise. Clin Orthop Relat Res. 2011 Feb;469(2):437-42.